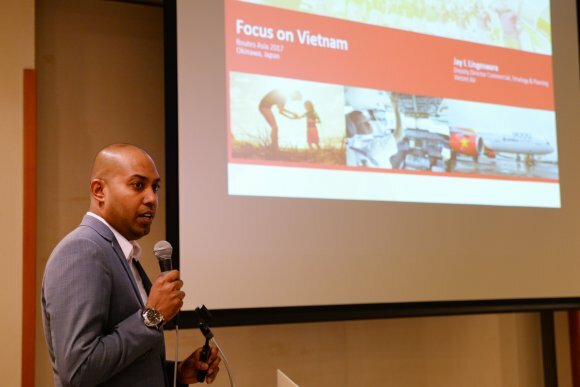 Eight questions for Jay L Lingeswara, who leads the strategy and planning management team at VietJet Air. I’m Jay L Lingeswara, deputy director at VietJet Air. Love to do what I do best. Leading the strategy and planning management team, to ensure VietJet Air effectively deliver on huge and often transformational projects. Proud to lead such a great team at VietJet Air. Working closely with the airline’s executive team. Enjoy helping my colleagues by getting them to focus on developing their many different skill sets as opposed to only focusing on the job in hand. As far as I am concerned, there are no worst parts of the job, but that is not to say there aren’t any challenges. Fortune favours the brave. Managing growth and costs effectively is a real balancing act, as is ensuring the airline always has the perfect combo of services and resources. However, I expect these are challenges shared by anyone working in airline industry. VietJet Air is lucky to have both strong inbound and outbound markets, with both boasting rapid growth. Our inbound market is twice as big as the outbound, although the latter has nearly doubled in size in the past two years. 2019 is off to a great start along with our incredible people and brand! My CEO, Madame Nguyen Thi Phuong Thao. She is a rare breed of thinker, dreamer and doer. Never afraid to fail. Home sweet home. And what I loved the most? Listening to my wife playing piano. Football with my three year-old son. Long baths. And I mean really long. What has been your favourite Routes event? 2017 in Barcelona, Catalonia. Great city and I truly enjoyed the event! Jay L Lingeswara will be taking part in the Conference Programme at Routes Asia 2019. Hear his views on the future of air transportation in Asia Pacific, and how tourism authorities, airlines and airports can work together to make a destination more attractive.